Who first explained the relationship between space and time? 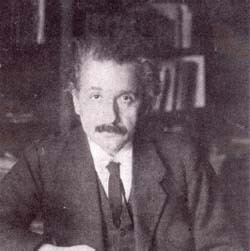 The famous German-American scientist Albert Einstein (1879–1955) first realized that, in order to explain the results of the Michelson-Morley experiment, travel through space and travel through time must be intimately linked. His special theory of relativity, published in 1905, showed that objects can move through time at different speeds in the same way that they can move through space at different speeds. Einstein thought there must be a very strong connection between space and time and that this connection was essential to describe the shape and structure of the universe. He did not have the mathematical expertise, however, to show how the connection might work. Einstein consulted his friends and colleagues to figure out the best way to proceed in his research. Aided by the discoveries of the German mathematician Georg Riemann (1826–1866) and the Russian-German-Swiss mathematician Herman Minkowski (1864–1909), and by the tutelage of Hungarian-Swiss mathematician Marcel Grossmann (1878–1936), Einstein learned the mathematical formulations of non-Euclidean elliptical geometry and tensors. In 1914 Einstein and Grossmann published the beginnings of a general theory of relativity and gravitation; Einstein went on to complete the formation of the theory over the next few years.